Flexible terms are available for; hot desking, dedicated desks, and private offices. Childcare facilities are available. Boardrooms and meeting rooms can be booked. There is an onsite management team, who are there to help make your stay as comfortable as possible. Reception services on hand, which include; postal handling and telephone answering. Located in Citta Mall. The space is surrounded by fantastic shopping, eateries, and a movie theatre. Lembah Subang is a 24 minute walk and Ara Damansara LRT station is a 13 minute walk away. It is just an 8 minute drive to Sultan Abdul Aziz Shah Airport. Consequently, there are many hotels situated nearby. This state-of-the-art MSC building benefits from a prestigious address in part of the Golden Triangle of Petaling Jaya, conveniently located close to a number of major highways. A contemporary co-working space with excellent amenities. Enjoy 24 hour access to the building. Administrative support is available. 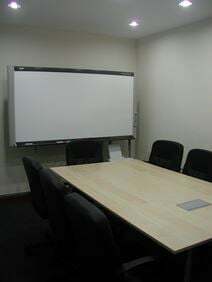 Meeting rooms are well-equipped with large TV screens and whiteboards. Located on First Avenue, next to One World Hotel and 1 Utama Shopping Centre. 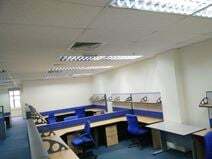 The space has excellent transport links, with direct access to Bandar Utama MRT Station. Nearby, there a number of cafes, bars and restaurants. A selection of office spaces is available to let in the commercial area of Kuala Lumpur, which hosts numerous companies and offices. These office spaces consists of individual offices, open-plan spaces, meeting rooms and lounge areas and are immediately available and fully equipped to a high standard. Just a few minutes’ away from the city centre, they are well connected to the major motorway junctions and enjoy a stunning view over the city. This is a contemporary business centre in the affluent business district of Phileo Damansara, home to major multi-national corporations and leading financial institutions. Fully-equipped offices are available with an array of facilities - internet, video-conferencing, printing, photocopy and fax. Professional support staff are on-site for all of your business needs. In terms of transport, SPRINT and LDP highways provide convenient road access and there are numerous buses too. 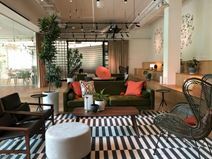 Located in one of Pealing Jaya's most up and coming districts, this impressive business centre offers virtual office solutions, private serviced offices and large co-working space. The centre provides a comprehensive list of facilities including fully equipped meeting and conference rooms, printing/copying facilities and reception services assisting with handling mail, answering calls and greeting clients. Office space prices ranging from RM598 - RM2400 per month. This centre is well positioned, close to public transport links as well as shops, restaurants and more. The centre offers secure office space, along with ample covered and open air car parking. Within the thriving atmosphere of Bandar Sunway, these rented offices offer a wide range of facilities which include corporate mailing address, dedicated telephone answering service, mail sorting, 24-hour access and CCTV. Secretarial services are available at a nominal charge. Fully-furnished meeting rooms, business lounge and top-of-the-range PABX telephone/fax system are also provided. 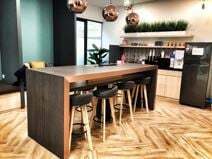 These offices are located nearby Sunway Pyramid Shopping Centre, Sunway Lagoon Theme Park and surrounded by colleges/universities (Sunway University College, Monash University, Inti College, Taylor's College). This building consists of a mixture of retail and office space, and is located in the heart of Damansara Perdana. 11 fully furnished suites are available on the 4th level, and the address is one of the most sought-after in the region. Situated in a mixed-use development which consists of retail, commercial and residential space, this modern building is home to brand-new office suites, spread over a 6,000 square feet footprint. Clients can benefit from 24-hour access with around the clock CCTV security, as well as a host of business support services from telephone answering to cleaning and maintenance services. Close to a range of amenities and facilities, this centre is well connected to transport options, food and beverage facilities, and other key facilities you may need from day-to-day. A hub of like-minded people, from a variety of industries. The friendly community team is able to assist with any business needs. There is 24 hour access to the space. Additionally, postal facilities, administrative support and beverages are all included. Located on Jalan PJU 5/1, in the heart of the city. Surian MRT Station is a five minute walk away. Additionally, the New Klang Valley Expressway (NKVE) is easily accessible from the space. Close-by, there are numerous cafes, restaurants and bars. A fully-furnished co-working space. The interior is modern, light and wooden. There are unlimited snacks, ice-cream, fruit water, tea, and coffee to keep you hydrated and fuelled for the day. There is an entertainment area, where you can play some video games. Enjoy 100Mbps Internet and multiple plug points. Enjoy a prominent address in the centre of Kota Damansara. Surian MRT Station is located nearby, there are also several bus stops and car parks. In the surrounding area there are a number of restaurants, banks, hotels, shops, and coffee shops. There is also a shopping mall, supermarket, gym and driving range. Kelab Golf Suri Selangor is 12 minute walk away, where you can entertain guests. This site is close to Kelana Jaya LRT station, with easy links to various major road links. Fully equipped office suites with a range of amenities and business support services available including complimentary WiFi, telephone answering services, 24 hour secure access, and pantry facilities to ensure you business can run smoothly within this space. Near to Paradigm Shopping Mall, this centre has great access to a number of retail venues, and food and beverage outlets for you to try in your work week. Dedicated desk, hot desk and private office solutions are available at this location. Spacious desks are accompanied by a lockable set of drawers. Event space and meeting rooms are accessible. 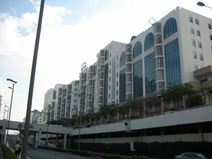 Situated in The Starling shopping mall, on Jalan SS21/37. Surrounded by numerous shops, restaurants, bars and cafes. It is a 22 minute stroll to TTDI MRT station. Close-by, there are a number of hotels and banks. A five-minute walk from the Paradigm Mall this centre provides a variety of private office suites that are supported by friendly on-site staff and reception services. Also just 20 minutes from the Sultan Abdul Aziz Shah Airport. This easily accessible centre is surrounded by a plethora of amenities from food and beverage venues to retail shops, hotels, financial facilities, and fitness facilities. A pet-friendly centre with pet-free options for those wanting distraction free work time. A one-stop convenient centre, this centre has all of the space options your business could need day-to-day, including phone booths, board and discussion rooms, complimentary beverages, WiFi, and administrative support. This 18-storey commercial office building provides some of the best views over Petaling Jaya and consists of 30 serviced office suites that are furnished and ready-to-use. Well connected to major arterial roads and public transportation, this centre also has great access to eateries, colleges, banking facilities, hotels and many important Government facilities including MBPJ, the post office, a police station and fire department. This impressive business centre is situated close to many residential buildings, as well as excellent transport links. The centre has 9 office suites available, all fully equipped and ready for your business. With a great location close to banks, eateries and retail, and opposite a shopping mall, this prestigious corporate building is home to our serviced office centre. Offering a range of work-space solutions, along with a host of professional services to support your business needs. This centre is part of a mixed-use development, which features condominiums and commercial retail space. This is a prestigious and highly accessible location for your business, close to excellent transport links. A full range of business support services is available to clients. 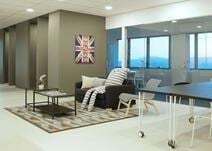 With open plan office space and fully furnished executive suites this professional business centre also provides a business lounge and meeting rooms from the 7th floor of a prominent business tower in the major hub of PJ City, Klang Valley. This modern and comfortable serviced office centre is strategically located just moments away from the city centre, and is housed in the tallest building in the area. A striking venue for your business, the centre offers a good range of business support services. This office suite has been recently refurbished to a high specification and equipped with all the modern business amenities. It is particularly suited for new business start-ups as well as major global corporations who are looking for a regional base in Malaysia. Strategically located in the heart of Klang Valley and surrounded by numerous banks, hotels, restaurants and clubs. The well-known Federal Highway provides easy accessibility to all the major roads. Strategically located at the crossroads of Petaling Jaya and Kuala Lumpur this business centre is spread over 2,500 sq. ft. in Section 16 and is made up of five fully furnished office suites , 15 workstations in an open-plan area and a meeting room.